Good afternoon everyone. It is an honor and a privilege to be with you today. My name is Mark Ishaug, and I am the CEO of Thresholds, Illinois’s largest and oldest community mental health organization. Since 1959, we have provided home, health, and hope to thousands of people with severe mental illnesses and other complicated challenges. Our research, employment, advocacy, care, and housing programs help people reach for and achieve recovery. I am a huge fan of Housing First. In fact, when I came to Thresholds two years ago and tried to get my head around all the cool stuff we do, it was crystal clear it all starts with housing. It always does. I am also a huge fan of supportive services. The evidence is unequivocal. Support services work! They help people find and keep housing, finish school and find employment, secure and maintain benefits, improve the patient experience, improve health outcomes, and save the system money. Housing and supportive services are a more humane and cheaper alternative to that which we are paying for today—jails, prisons, nursing homes and unnecessary hospitalization. So as you can tell, I was asked—and tasked—to talk for 10 minutes about Housing First and Supportive Services. I actually already gave a pretty good talk on the subject late last year. So, instead I am going to talk about giraffes. Yep, giraffes. Earlier this year I served on a panel discussing the future of the nonprofit sector and private philanthropy. The key note speaker was Sterling Speirn, the former CEO of the Kellogg Foundation, one of the country’s largest, most innovative and effective private foundations. And Sterling is a superstar. 1. They always seem to be looking down on you. 2. They feel like they are sticking their necks out for you. 3. They couldn’t be more ill-equipped in their earnest attempts to work at the grassroots level. He implored private foundations to find a better and more appropriate mascot. So was Sterling criticizing private foundations, or giraffes, or both? He really got my Irish up. I am half Norwegian, but I can’t say he got my Norwegian up! He got my Irish because I love giraffes. I worked and lived in Africa for several years, and I came to love these animals. Love them! Nobody is gonna mess with giraffes when I am around. So I began to think that our sector needs an animal mascot. Schools have them. Florida Gators, Marquette Mustangs. Sports teams have them. Chicago Bears, Baltimore Ravens. Cereals have them. Tony the Tiger, Toucan Sam. Heck, even insurance companies have them. Doesn’t Geicko have a gecko or a lizard or something green? So if private philanthropy should eschew the giraffe, I would argue that our sector — the housing, social services and behavioral health nonprofit sector — should warmly embrace this creature who some believe should not exist at all, a creature that is as resourceful and flexible and wonderful as they come. 2. Giraffes are the tallest, strongest and most peaceful animal on the planet. We rise above the fray. We can see the forest through the trees. We take the long view of history knowing that that the arc of moral universe is long but it bends towards justice, and we confront every injustice with peace, purpose and passion. 3. 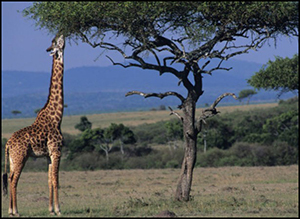 Giraffes can live for long durations without water. Nothing describes our sector better than this. How long have we had to live without a foundation grant? How long have we had to wait for the state to pay its bills? How long have we endured cuts in human service budgets while corporate tax loop holes remain intact? And how long have our clients gone without food and water, because they were living on the streets or on the subways, because their social security benefits were pending or Medicaid benefits were suspended when they were in jail, because they were denied psychiatric medications because of policies devised to save money that actually cost the system and tax payers more. We are all Giraffes! 4. Giraffes require less than 30 minutes of sleep a night. We do whatever it takes to get the job done. Our emergency room psychiatric assessment teams? 24/7, 365. Our supervised residential programs? 24/7, 365. Our client crisis hotlines? 24/7, 365. Our commitment to each and every client? 24/7, 365. Polar vortices (can you believe I had to make vortex plural?! We had 3 in Chicago, how about you?) and heat waves are just excuses for our staff to work harder and get even less sleep. 5. Giraffes are peaceful but not voiceless. We speak for those who often don’t have a voice, who have been silenced by intimidation, abuse, fear of incarceration or deportation, or loss of their children. People who have been silenced because they had been labeled crazy, lazy, or stupid. We give them voice. And when we really do our jobs well, we ensure that our clients use and raise their own voices. 6. 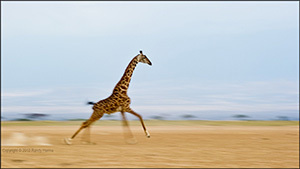 Giraffes can kill a lion with one swift kick. Don’t get me wrong here. I am not advocating violence, and certainly not killing anyone or anything. I am a vegan and so is our giraffe friend! Giraffes are vegans. How can you not love that? But sometimes we need to kick the lyin’ lions right in the behind. We need to kick and scream to make sure funding for housing and healthcare and food stamps is increased and not decreased. We need to kick and scream to make sure Medicaid expansion happens in red states and not just blue states. We need to kick and scream to ensure that jails are not the largest mental health providers in our states, but that community mental health and housing providers are! We need to kick the lion. 7. Giraffes nap and give birth standing up. This says it all. We are the consummate multi-taskers with no time to waste. Eat, work, nap, give birth, repeat. 8. Giraffes have 4 stomachs. As do we. You didn’t know that? One for the nourishment we need physically and emotionally to do the hard work we do, and 3 for everything we have to stomach from those who try to stigmatize, marginalize, and ostracize our clients and agencies. We have 4 stomachs and we have abs of steel. 9. 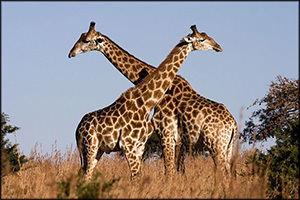 Giraffes stick out their necks and love to neck! We don’t want or need to be popular. We stick our necks out for those who need us the most. But we also like to neck, to have fun, to horse or giraffe around. This is hard work but we make it fun! 10. Giraffe hearts are 24 pounds and 2 feet in length. What a metaphor this is. I use the word love almost every day when I talk about my staff, our clients, our volunteers, our work, and our sector. Those in our field can only do this work if they have giraffe-sized hearts. Commitment to social justice—critical. Belief in a better and more fair society—sine qua non. Smarts to fix seemingly intractable problems—required! But what it really takes, above all, is heart. Kindness and compassion. A softness and a gentleness of spirit. Loving kindness. So you, my friends and colleagues, you are giraffes. Our clients are giraffes. Our donors and our patrons are giraffes. And our politicians who are using our money and their power to change systems to create fairness and freedom, housing and healthcare, they are giraffes. I thank you and honor you for your voices and for giving voice to others. I thank you and honor you for your indefatigable spirit. I thank you and honor you for being strong, and peaceful, and fierce, and fast. I thank you and honor you for having stomachs and necks and hearts second to none. As two of my heroes, Martin Luther King, Jr, and John Lennon would say. All we need is love, and a revolution. I would add: and more giraffes. This entry was posted in News and tagged housings, Mark Ishaug, mental health, mental illness, Supportive Housing, supportive services. Bookmark the permalink.